Self-propelled lawn renovator (verti-cut & seeder). Hydrostatic drive, 0 - 3 mph forward, 2 mph reverse. Easy to use, can be operated with one hand. Cuts grooves in the soil every 2". Re-seeding blade depth from 1/8" to 1/4" for quick seed germination. 28" height when the handles are folded for transport. 45" height when handles are are working height. 27" long when handles are folded - 52" long when handles are up. Weighs 270 lbs. - requires a trailer or ramps to load and unload. Seed hopper holds up to 40 lbs. Easy to adjust seeding rate. 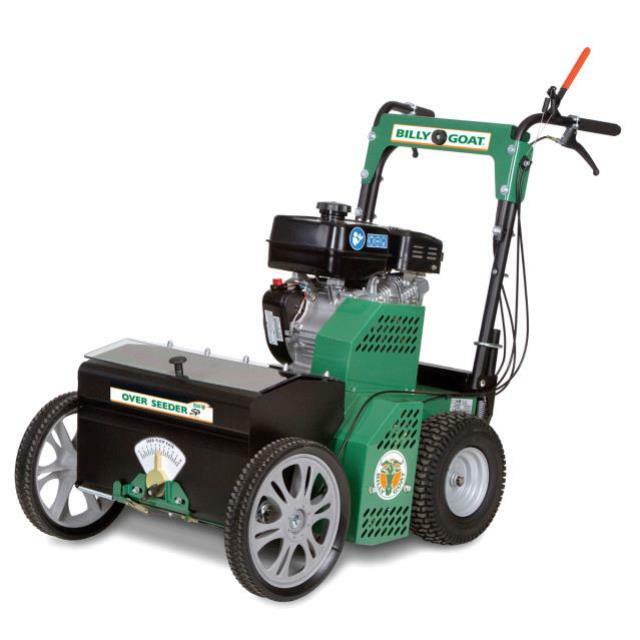 * Please call us with any questions about our power seeder self prop 9hp rentals in Oak Grove MO, Blue Springs MO, Independence MO, Lexington MO, Odessa MO, Independence MO and Western Missouri.